Home Throwback Thursday	Musical Furniture Game has Commenced! Happy Thursday, Everyone! Well, tomorrow is D-Day for closing on our new house. We have been in limbo for a week and a half while we moved out of one house and awaited closing on the other. And because the new house is smaller than the old house, we’ve had to do quite a bit of juggling to make it all work. Hence, the musical furniture game has commenced! We’ve been at Happy Hill (our lake house) since we closed on our Doylestown house on May 23rd. Truly it has been a nice sort of in between houses break. I wish the weather had been a bit better (tons of rain) but it gave us time to arrange for our furniture to arrive, tie up loose ends and to do a final walk through on the new place. Tomorrow we close on the new house bright and early. 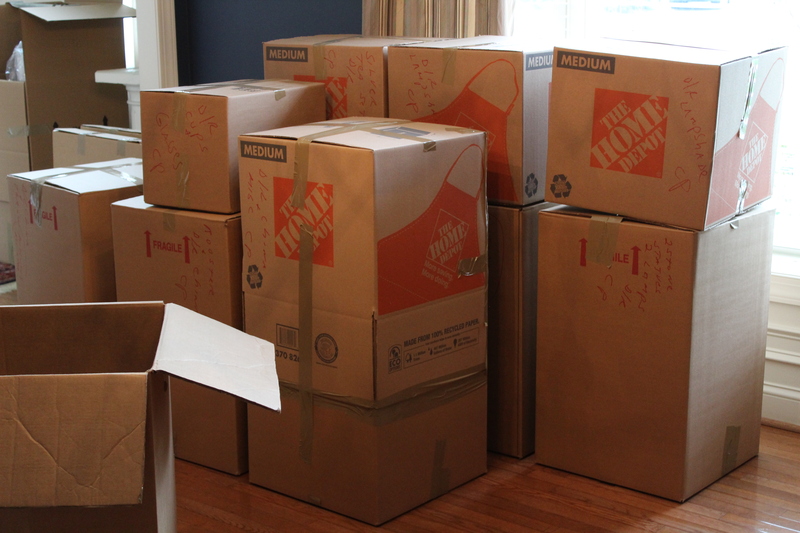 We will meet the movers shortly thereafter. Our furniture has been on the truck for a week and a half and is making its way from Pennsylvania to North Carolina as we speak! Because we had lag time in between closings, the moving company charged us a fee for keeping the furniture on the truck instead of off-loading and going into storage for such a short time. We liked this idea better since it reduces the risk of things getting broken or missing in between. Our new house is a lot smaller than our last house, which is a good thing. We are happy to downsize to something that is more livable for my husband and me. And Lacey, of course. We sold and got rid of tons of furniture and extras on the other end but we still have more than we need. So, we are taking some things from the Doylestown house and putting them at Happy Hill. And a few things at Happy Hill are going bye-bye. Take this kitchen table for instance. Today we sold it on the Facebook Marketplace. This table is a massive 63″ round monster and is super heavy. We love a round table as it makes for easy conversation, etc. But this one is so large that it couldn’t be centered under the chandelier. (And you know how that makes me crazy.) Also, the chairs are big. We have a total of 7 chairs and they all can’t fit around the table at the same time without major crowding. So, while it was a great table with a nice look it just didn’t work in this space. So now it’s gone! Because our new house doesn’t have a formal dining room or an eat-in kitchen we didn’t need our sweet little Pottery Barn table and chairs. I am sentimental about this dining set since we bought it when we moved to Doylestown 15 years ago. We ate at this table as a family when our boys were still living at home and I can’t bear to part with it. We think it will fit perfectly in the kitchen at the lake. The top needs a fresh coat of black paint and I’ll probably buy a piece of glass to protect the top. Otherwise, the set is in perfect shape. The smaller 60″ size with a pedestal will better suit the space. Here it is in our last kitchen…. Importantly it should fit squarely under the kitchen chandelier. We also have 3 matching counter height bar stools so we will use those at the lake house too. The 3 bar stools at the lake will be moved to the new house since they are more of a French Country look with the curved distressed white wood and rush seats. See? Musical furniture! The cute little Pottery Barn table and chairs are on the truck. It will all be off-loaded at the new house and we will bring it over this weekend to the lake house. A few other pieces will make their way to Happy Hill once we find a place for everything at the new house. Until we move in, it will be difficult to decide what fits and what doesn’t. So, wish us luck! The next few days will be busy and chaotic but we are so excited the time has finally arrived to move into our new house. A new chapter awaits!